I’m a longtime fan of not just Botkier as a brand, but the Venice line in particular. Great leather, lots of zipper accents…what’s not to like? Nothing, that’s what. The latest iteration of the Botkier Venice Crossbody just takes that to a whole new level. You see, I have this thing for purple bags. I’m not exactly sure why, since I wouldn’t count purple among my favorite colors if you were to ask me, but a good bag in a nice shade of violet always pulls directly at my heartstrings. With that in mind, of course I like this bag. 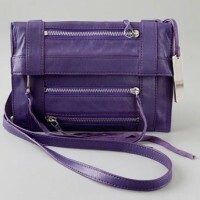 It’s functional, attractive, and has a little bit more design oomph than your average crossbody. Zippers and tassels do double duty as both fashion and function, and this little bag is just big enough to hold all of your essentials without weighing you down. I can’t wait to see what other colors it might come in for spring, but I bet that after all is said and done, this purple will still be my favorite. Buy through ShopBop for $295.